For other people named Jon Anderson, see Jon Anderson (disambiguation). John Roy Anderson (born 25 October 1944), known professionally as Jon Anderson, is an English singer, songwriter, and multi-instrumentalist best known as the lead singer of the progressive rock band Yes, which he co-founded in 1968 with bassist Chris Squire. He was a member of the band across three tenures between 1968 and 2008. Anderson is a current member of Yes Featuring Jon Anderson, Trevor Rabin, Rick Wakeman. John Roy Anderson was born on 25 October 1944 in Accrington, a town in Lancashire in north west England. His father Albert was from Glasgow, Scotland and served in the army in the entertainment division and later worked as a salesman; his mother Kathleen was of Irish and French ancestry and worked in a cotton mill, then the biggest export from Lancashire at the time. Together they became county champions in ballroom dancing, winning several awards. Anderson claimed they named him after an English singer who toured as "John Roy the Melody Boy" and the Scottish name Royston. Anderson grew up on Norfolk Street with brothers Tony and Stuart, and sister Joy. He is the third youngest. As a youngster, Anderson became a fan of several musicians, including Elvis Presley, Eddie Cochran, the Everly Brothers, and Jon Hendricks. Anderson attended St. John's School where he organised daily football matches during lunch break. He was not a strong academic, and remembered he "was always getting into trouble for messing around and singing too loud". There, he made a tentative start to a musical career, playing the washboard in Little John's Skiffle Group who performed songs by Lonnie Donegan, among others. At fifteen, Anderson left school after his father became ill and took up work on a farm, a lorry driver transporting bricks, and a milkman to help support the family. A keen football fan, he tried to pursue a career at Accrington Stanley F.C., but at 5 feet 5 inches (1.65 m) tall, he was turned down because of his frail constitution. He remained a fan of the club, and was a ball boy and mascot for the team for one year. Anderson dropped the "h" from his first name in 1970. Anderson had no particular desire to become a singer at first until his brother Tony took up singing and joined the Warriors, a local group also known as the Electric Warriors. After one of the backing vocalists left the group, Anderson filled in the position, and found music more enjoyable and a better choice for money than manual labour. The group performed mainly cover songs from several artists, including the Beatles, and performed across Lancashire and the club circuit in Germany for over a year. Anderson is heard on their first two recorded songs, "You Came Along" and "Don't Make Me Blue", released in 1965. After the Warriors split in Germany in late 1967, the band returned to England while Anderson stayed behind. He briefly became singer in the Party, a band from Bolton who were in Germany. After returning to London in March 1968, Anderson met Jack Barrie, owner of the La Chasse drinking club in Soho who befriended the rest of the Warriors after they had relocated to the city. With no money or accommodation, Barrie allowed Anderson and Warriors keyboardist and vocals Brian Chatton to stay with him. Anderson helped out by working at La Chasse; during this time he got talking to Paul Korda, a producer for EMI Records who took him on to sing several demos. During the search for material to record, Barrie got in touch with Elton John and Bernie Taupin of DJM Records to put some music together, but felt Anderson did not like much of it. Meanwhile, Anderson travelled to the Netherlands to join Les Crunches, a band he met in London, but promptly returned when he found out some of his demos were to be released as singles by Parlophone Records. Released under his pseudonym Hans Christian, the first, an orchestrated cover of "Never My Love" by the Association with "All of the Time" on its B-side, received a positive reception from New Musical Express and Chris Welch for Melody Maker who wrote in March 1968, "A blockbuster of a hit from a young fairy tale teller with an emotion packed voice." Anderson's second single, "(The Autobiography of) Mississippi Hobo"/"Sonata of Love", was released two months later; neither song was successful. Barrie and Korda then took Anderson to see local group the Gun and together rehearsed for well received gigs at the UFO and Marquee clubs in London, the latter as an opener for the Who, which led to several gig offers. However, the rest of the group believed they could reach success without a lead vocalist and sacked Anderson. In May 1968, Barrie introduced Anderson to Chris Squire, bassist of the London-based rock band Mabel Greer's Toyshop, which had previously included guitarist Peter Banks. The two talked, and found they shared common musical interests such as Simon & Garfunkel and the idea of vocal harmonies. In the following days, they developed "Sweetness", a song later recorded on the first Yes album. Anderson found himself on lead vocals for some Mabel Greer gigs afterwards, and talks of the formation of a new, full-time band developed. In June 1968, Anderson and Squire hired Bill Bruford to replace founding drummer Robert Hagger, and Anderson secured £500 from John Roberts, owner of a paper manufacturer, to rent space in The Lucky Horseshoe cafe in Soho so a new, full-time band could rehearse. At their conclusion a month later, a line-up of Anderson, Squire, Bruford, Banks, who replaced a departing Clive Bayley, and keyboardist Tony Kaye, who Anderson met in Leicester four years prior, was formed. They then renamed themselves Yes, originally Banks's idea. Anderson's first gig with Yes followed on 4 August 1968 at a youth camp in East Mersea in Essex. Anderson singing at a Yes concert in 1977. Although the band had no formal leader, Anderson served as its main motivating force in their early days, doing most of the hustling for gigs and originating most of their songs. He played a key role in initiating their more ambitious artistic ideas, serving as the main instigator of some of the band's more popular songs, including "Close to the Edge", "The Gates of Delirium", and "Awaken", and the concept behind their double concept album Tales from Topographic Oceans (1973). Despite his initial lack of instrumental skills, Anderson was strongly involved in the selection of successive Yes members chosen for their musicality - guitarist Steve Howe (who replaced Banks in 1970), Kaye's successive replacements Rick Wakeman and Patrick Moraz, and drummer Alan White, who replaced Bruford in 1972. Ambitious and nicknamed "Napoleon" by the rest of the band, Anderson was also fond of sonic and psychological creative experiments, and in so doing contributed to occasionally conflicted relationships within the band and with management. An example of this was his original desire to record Tales from Topographic Oceans in the middle of the woods. When the band voted to record in a studio, he decided to arrange hay and animal cut-outs all over the floor to create atmosphere. Anderson described the album's supporting tour as one of the low points of his career, as a portion of the audience and the band were unhappy with the album. In addition to Yes, Anderson appeared as a guest singer on Lizard by King Crimson for "Prince Rupert Awakes", the first part of their 23-minute title track recorded in 1970. He was chosen for the part as the desired vocal range was unattainable by the group's then-lead vocalist, Gordon Haskell. In 1974, Anderson co-wrote "Pearly Gates" with Iron Butterfly drummer Ron Bushy on the band's album Scorching Beauty. This was followed by his first collaboration with Greek musician Vangelis, singing on "So Long Ago, So Clear", the last section of "Heaven and Hell Part I" on his 1975 album Heaven and Hell. In August 1975, Yes took an extended break for each member to release a studio album. Anderson chose a concept album, Olias of Sunhillow, about an alien race of four tribes and their journey to a new planet as theirs is under threat from destruction. Olias, one of the three main characters, builds the Moorglade Mover, an aircraft formed of living organisms to transport everyone to their new home. Anderson gained inspiration from science fiction and fantasy novels, works by J. R. R. Tolkien, The Initiation of the World by Vera Stanley Alder, and the art work from Yes's Fragile. He recorded the music from his garage in six months, learning to play all instruments himself, including several types of drum, stringed, and percussion instruments associated with world or ethnic music, which took up as many as 120 track recordings in its original form. Anderson found the experience a valuable one in learning about music. Atlantic Records released the album in July 1976, and it reached number 8 in the UK and number 47 in the US. Between 1976 and 1979, Anderson recorded Going for the One and Tormato with Yes and completed their supporting tours. In February 1979, he reconvened with Vangelis to start recording as Jon and Vangelis. Their first album, Short Stories, was recorded in a matter of weeks with minimal preconceived ideas which Anderson found to be a refreshing experience. Released in January 1980, Short Stories went to number 4 in the UK. In 1979, Anderson played the harp on "Flamants Roses" on Vangelis's album Opéra sauvage and wrote music for Ursprung, an act for a three-part modern ballet named Underground Rumours performed by the Scottish Ballet company, that also featured music by Ian Anderson. The choreographer was Royston Maldoom and the lighting designer was David Hersey. In October 1979, Anderson travelled to Paris to record a new Yes album with producer Roy Thomas Baker. Progress staggered early into the sessions following disputes over the band's musical direction; material prepared by Anderson and Wakeman was not met with enthusiasm by their bandmates, who started to put down tracks without them that was released on Drama. "Very quickly", recalled Anderson, "the mood changed from enthusiasm to frustration and then complete confusion". Matters failed to improve when they reconvened in February 1980, and Anderson and Wakeman left in the following month. They were replaced by Trevor Horn and Geoffrey Downes of the Buggles. Anderson acquired Jannis Zographos as his new manager, who also handled Vangelis, and sung on "Suffocation" and "See You Later" for Vangelis's album See You Later, released in 1980. In 1979 he recorded his first album in collaboration with Vangelis, Short Stories, which was released in 1980. After he secured a recording deal with Virgin Records, Anderson retreated to southern France to write material for a solo album. His proposals for albums based on the Russian-French artist Marc Chagall and the book A True Fairy Tale by Daphne Charters were not enthusiastically received by the label's management, who lost interest and requested their advance back. Anderson spent much of 1980 recording a collection of songs for Song of Seven with a group of musicians he named the New Life Band, which Atlantic agreed to release. When it was put out in November, it reached number 38 in the UK and number 143 in the US. Anderson completed his first solo tour with the band, performing a mix of solo and Yes material in Germany and England. In 1981, Anderson played on Wakeman's concept album 1984 and released his second album with Vangelis in July 1981, The Friends of Mr Cairo. The album produced two singles, "I'll Find My Way Home" and "State of Independence". The album was also notable for the title track, which was an ode to classic Hollywood gangster films of the 1930s and 1940s with voice impressions of Humphrey Bogart, Peter Lorre and James Stewart which paid homage to The Maltese Falcon (1941). In 1982, Anderson released Animation and in 1983, appeared on "In High Places" and "Shine" from Crises by Mike Oldfield. Also that year, he performed with Béla Fleck and the Flecktones and attempted to form a band with Wakeman and Keith Emerson, but it fell through. In early 1983, Anderson was contacted by Phil Carson of Atlantic Records who suggested that he hears a tape of demos that Cinema, a new group formed of Squire, White, Kaye, and guitarist Trevor Rabin, with Horn as producer, had developed for a new album. Anderson was invited to sing lead vocals on the album and join the group, which he accepted. Cinema then changed their name to Yes, and 90125, released in November 1983, became Yes's best selling album. In 1987, the group released its successor, Big Generator. Anderson appeared on the song "Cage of Freedom" from the 1984 soundtrack for a re-release of the Fritz Lang film Metropolis. In 1985, his song "This Time It Was Really Right" was featured on the soundtrack for St. Elmo's Fire. He also sang "Silver Train" and "Christie" on the soundtrack to Scream for Help by John Paul Jones. Along with Tangerine Dream, he appeared on the song "Loved by the Sun" for Legend (1985). Anderson released a Christmas-themed solo album, 3 Ships (1985). Biggles: Adventures in Time (1986) features a song sung by Anderson. During this year, he recorded some demo tracks that would later be reworked. He and Vangelis also started writing new songs and recording demos for another album. Though the album was not made, they performed live together on 6 November 1986. The last three years of the 1980s saw Anderson sing on "Moonlight Desires" on Gowan's album Great Dirty World (1987), record his fifth solo album In the City of Angels, sing on "Stop Loving You" on the Toto album The Seventh One (1988), and recorded an album that would later be released as The Lost Tapes of Opio. He also sang on the songs "Within the Lost World" and "Far Far Cry" for the Jonathan Elias album Requiem for the Americas. In 1988, after Yes' Big Generator tour, Anderson reunited with Bruford, Wakeman, and Howe to form Anderson Bruford Wakeman Howe (ABWH) with bassist Tony Levin, who recorded one album and supported a successful world tour. In 1990, after the ABWH tour, a series of business deals caused ABWH to reunite with the then-current members of Yes, who had been out of the public eye while searching for a new lead singer. The resulting eight-man band assumed the name Yes, and the album Union (1991) was assembled from various pieces of an in-progress second ABWH album, as well as recordings that Yes had been working on without Anderson. A successful tour followed. Jon and Vangelis released their fourth album, Page of Life, in 1991. 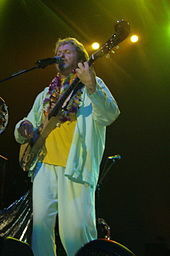 In 1992 Anderson appeared on Kitaro's album Dream, adding both lyrics and vocals to three songs: "Lady of Dreams", "Island of Life" and "Agreement". He also toured South America with a band that included his daughters, Deborah and Jade. He appeared on the song "Along the Amazon" which he co-wrote for violinist Charlie Bisharat's album of the same name. In 1993, Anderson started work on Change We Must, his seventh solo album, featuring a mixture of original and orchestrated versions of songs he sung with Yes, Vangelis, and his solo career. It was released in October 1994 on EMI and Angel Records. From 1992 to 1994, Anderson recorded the Yes album Talk (1994). "Walls", written by Rabin and Roger Hodgson, reached number 24 on the Billboard Hot Mainstream Rock Tracks chart. In July 1994, Anderson released Deseo, a solo album of Latino-influenced music. There were plans to release a live album called The Best of South America, but it was not released due to management issues (though some copies were already released by Yes Magazine). Anderson sang on the 7th Level children's video game Tuneland. Also, his son Damion released a single called "Close 2 the Hype", which featured him and Jon on vocals. In August 1995, Anderson relocated to San Luis Obispo in California. His eighth studio album, Angels Embrace, was released on 26 September 1995 on the Higher Octave Music label. His first primarily instrumental album, it displays Anderson performing ambient music with assistance from Steve Katz and Keith Heffner on keyboards and his two daughters on vocals. Anderson followed this with Toltec, a concept album released on 30 January 1996 on Windham Hill Records that tells the story of Toltec, "a Native American concept of a group of people who have been all over the Earth, existing within different cultures throughout the centuries". The album was meant to be released in 1993 as The Power of Silence, minus the sound effects and narration added later, but it was cancelled following issues with Geffen Records. In the mid-1990s, Anderson had planned to tour and record in China, but abandoned the idea in favour of writing and recording new music with Yes after Wakeman and Howe rejoined the band. Anderson's move to San Luis Obispo influenced the decision for Yes to record their three-night stint at the town's Fremont Theater in March 1996, as part of their subsequent studio and live album sets Keys to Ascension and Keys to Ascension 2, released in 1996 and 1997, respectively. On 12 May 1996, Anderson performed an 80-minute set at a Mother's Day concert in Paso Robles, California formed of Yes, Jon and Vangelis, and solo material. Anderson's next album, Lost Tapes of Opio, was released in 1996 on audio cassette through his Opio Foundation. Formed of songs recorded since the 1980s, proceeds from the release were donated to UNICEF. In 1997, Anderson released the Celtic-influenced The Promise Ring with his second wife, Jane Luttenburger, sharing vocals. The album is a live recording of music performed by them and members of the Froggin' Peach Orchestra, the name given to a group of 28 musicians based in the Frog & Peach pub in San Luis Obispo. During their honeymoon in 1997, Anderson and Luttenburger recorded Earthmotherearth which was followed by The More You Know in 1998, recorded in Paris with French artist Francis Jocky. It was Anderson's last studio release for 13 years. Anderson appeared on the song "The Only Thing I Need" by act 4Him in 1999; it was recorded for Streams, a multi-group album. Steve Howe's tribute album Portraits of Bob Dylan also featured a cover of the Bob Dylan song "Sad Eyed Lady of the Lowlands" with Anderson's vocals. He also recorded with the Fellowship on their album In Elven Lands, inspired by the works of J. R. R. Tolkien. In 2000, Anderson had started work on a sequel album to Olias of Sunhillow named The Songs of Zamran: Son of Olias. Development on the project slowed since then; in 2011, he reasoned the delay as it spans up to three hours in length, of which he has written the majority of it, but needs additional time "to figure out how to recreate it correctly". Anderson expressed a wish of putting out an interactive album with "an app that allows people to go on a journey, [to] choose a new journey every time they open it up, and hear it in a different way every time". In September 2004, Yes wrapped their 35th Anniversary Tour and they entered a four-and-a-half year hiatus. In the tour's last week, Anderson was suffering from stress, asthma, bronchitis, and exhaustion. In 2004, Anderson appeared with the Contemporary Youth Orchestra of Cleveland and returned in 2010 for a second performance. A show broadcast from Washington D.C. on satellite radio was released on a DVD called Tour of the Universe in 2005. This release coincided with the release of Anderson's single "State of Independence". In 2006, Anderson performed "Roundabout" with the Trans-Siberian Orchestra. Later that year, Anderson and Wakeman toured the UK. In 2007, Anderson sang on Culture of Ascent by Glass Hammer, and appeared as part of a vocal ensemble on "Repentance" on Systematic Chaos by Dream Theater. Also in 2007, Anderson toured as part of the Paul Green School of Rock Music. In 2008, Anderson released From Me to You, an ambient album of his vocals with birdsong, which was added to The Lost Tapes. He appeared on "Sadness of Flowing" which he co-wrote for Peter Machajdík's album Namah and he made similar contributions to a re-mastering of Tommy Zvoncheck's album ZKG. In May 2008, during plans for a Yes tour to commemorate the band's fortieth anniversary, Anderson suffered an asthma attack, and diagnosed with respiratory failure. In 2009, Anderson had regained enough strength to complete a solo European tour named Have Guitar, Will Travel. This was followed by a North American leg through 2010. A sample of Anderson's vocals from Mike Oldfield's "In High Places" is prominently featured on "Dark Fantasy" by Kanye West. In 2010, Anderson and Wakeman resumed touring as Anderson/Wakeman and released their first collaborative album, The Living Tree. In June 2011, Anderson released his fourteenth solo album Survival & Other Stories. He invited people to submit music to him online and used them as the basis for the new material. In October 2011, Anderson released a single-track EP entitled Open, a 20-minute piece with a group of additional musicians including orchestral arrangements and a choir. In 2012, Anderson continued work on a sequel to Olias of Sunhillow. In January 2013, he announced that the project is named The Songs of Zamran: Son of Olias. In 2013, Anderson performed solo shows worldwide, including Australia, North America, Europe, and Iceland, followed by a North and South American tour from February 2014. Later in 2014, a charity single featuring Anderson and Matt Malley entitled "The Family Circle" was released. From 2014 to 2016, Anderson collaborated on a recording and touring project with violinist and composer Jean-Luc Ponty named Anderson Ponty. He announced the project in July 2014, with the intent on releasing an album of original songs and music the two had written in their own careers with new arrangements. Ponty stated: "The idea is to keep our musical personalities and the original sounds, but the production will be more modern". The pair toured with a backing band from 2014 to 2016 and released a live album and DVD, Better Late Than Never. During his time collaborating with Ponty, Anderson was also working on a studio album with Swedish guitarist and songwriter Roine Stolt. Their album Invention of Knowledge was released in 2016, and features various members of Stolt's band the Flower Kings as additional musicians. In January 2016, Anderson announced the formation of Anderson, Rabin and Wakeman, a new group formed of Trevor Rabin and Rick Wakeman, with the intention to tour and record new material. They have completed two concert tours, with a live album scheduled for release in September 2018. A studio album of new material is in progress. In April 2017, Yes were inducted into the Rock and Roll Hall of Fame. Anderson sang "Roundabout" and "Owner of a Lonely Heart" at the ceremony. Anderson aims to complete his solo album 1,000 Hands in late 2018. He had started it almost 30 years prior and named the album accordingly due to the many musicians that play on it, including Howe, Ponty, Chick Corea, and Billy Cobham. Anderson plans to release the album in three parts, starting in September 2018, with a tour to follow which he wants to document on film. In December 2018 Anderson released a video for a new song, "Love is Everything", to promote his forthcoming album 1000 Hands: Chapter One. It is a commonly held misconception that Anderson sings falsetto, a vocal technique which artificially produces high, airy notes by using only the ligamentous edges of the vocal cords; however, this is not the case. Anderson's normal singing/speaking voice is naturally above the tenor range. In a 2008 interview with the Pittsburgh Post-Gazette, Anderson stated, "I'm an alto tenor and I can sing certain high notes, but I could never sing falsetto, so I go and hit them high." Anderson is also responsible for most of the mystically themed lyrics and concepts which are part of many Yes releases. The lyrics are frequently inspired by various books Anderson has enjoyed, from Tolstoy's War and Peace to Hermann Hesse's Siddhartha. A footnote in Paramahansa Yogananda's Autobiography of a Yogi inspired an entire double album Tales from Topographic Oceans (1973). Recurring themes include environmentalism, pacifism and sun worship. Anderson married Jennifer Baker on 22 December 1969; they divorced in 1995. They have three children: Deborah (b. 1970), Damion (b. 1972) and Jade (b. 1980). Deborah is a photographer and sang on her father's solo album Song of Seven (1980), Anderson Bruford Wakeman Howe (1989), and Angel Milk (2005) by the French electronica band Télépopmusik. Damion is a musician and spoke the final lines on the Yes song "Circus of Heaven" on Tormato (1978) when he was six years old. He released the EP Close to the Hype (1994) with his father. Jade's birth is celebrated in her father's song "Animation" on his album of the same name. She sang backing vocals on many of his later albums and released a solo album in Japan. In 1997, Anderson married American Jane Luttenberger. Yes drummer Alan White was his best man at the ceremony. In 2009, Anderson became an American citizen. His goddaughter was Ariane Forster, better known as Ari Up, lead singer of the Slits. Anderson was a smoker in the 1960s and 1970s and once tried cocaine, but "didn't like it." He now lives a much healthier lifestyle, particularly in his later life, with vitamin supplements and meditation. In the mid-1970s, Anderson became a vegetarian, as did most members of Yes; however, in an interview he stated, "I was a veggie for a while, but again I grew out of that. But I do eat very healthy." In a 16 August 2006 interview on The Howard Stern Show, Anderson said he eats meat, mostly fish, on occasion. In the interview, he also stated he had a spiritual adviser that "helped him see into the fourth dimension". Before live performances, he often meditates in a tent with crystals and dreamcatchers, a practice he started in the 1980s. Anderson's religious beliefs are syncretic and varied, including respect for the Divine Mother Audrey Kitagawa. One of Anderson's passions is painting, and he uses his art as another channel for his creativity and self-expression. His artwork is available to view on his official website. He lived in France with Jennifer Baker at a farm in Saint-Paul de Vence for over five years from the very late 1970s, became a friend of his nearest neighbours, the painters Marc Chagall and André Verdet [fr; de; es], (inspiring some of his songs and musical themes). In 1990 he returned in France to record demos between Le Domaine de Miraval still in Provence at Le Val and Paris, this time with ABWH for the perspective of an hypothetical second album. On 13 May 2008, Anderson suffered a severe asthma attack which required a stay in hospital. According to Yes' website, he was later "at home and resting comfortably." Yes' planned summer 2008 tour was subsequently cancelled, with the press release saying, "Jon Anderson was admitted to the hospital last month after suffering a severe asthma attack. He was diagnosed with acute respiratory failure and was told by doctors to rest and not work for a period of at least six months." Further health problems continued through 2008. In September 2008, Anderson wrote that he's "so much better...so grateful and so blessed...I look forward to 2009 for the "Great Work" to come." He started singing again in early 2009. In 2009, he returned to touring (solo), performed along with Peter Machajdík and an ensemble of Slovakian musicians on Tribute To Freedom, an event to commemorate the fall of the Iron Curtain in former Czechoslovakia at Devin Castle near Bratislava, Slovakia, and continued touring in 2010 and the autumn of 2011, with Rick Wakeman for a UK tour (2010) and the eastern US (2011). ^ a b c "Jon Anderson's biography". 2003. Retrieved 4 March 2008. ^ Greene, Andy (20 December 2016). "Yes' Steve Howe on Rock Hall Honor: 'I Don't Regret the Wait'". Rolling Stone. Retrieved 20 December 2016. ^ a b c d e Welch 2008, p. 16. ^ a b c Welch 2008, p. 17. ^ a b Welch 2008, p. 18. ^ a b c d e Blake, Mark (1 September 2016). "Jon Anderson: There's No Point Pretending That I'm Mates With Yes". TeamRock. Retrieved 2 September 2016. ^ a b Morse 1996, p. 2. ^ Snyder, Ryan (10 December 2008). "Yes: The Carolina Theatre is ready for big rock shows!". Yesweekly.com. Archived from the original on 22 August 2011. Retrieved 26 October 2011. ^ "Rock star Jon Anderson to be ambassador for home club Accrington Stanley". Lancashire Telegraph. ^ a b Welch 2008, p. 19. ^ a b c Hedges 1982, p. 13. ^ a b c Welch 2008, p. 21. ^ a b c d Hedges 1982, p. 20. ^ a b Welch 2008, p. 22. ^ Welch 2008, p. 23. ^ Welch 2008, p. 24. ^ Welch 2008, pp. 40–41. ^ Morse 1996, p. 8. ^ Welch 2008, p. 45. ^ "Jon Anderson on Outsight Radio Hours : Outsight Radio Hours : Free Download & Streaming : Internet Archive". Archive.org. 10 March 2001. Retrieved 16 July 2014. ^ Welch, Chris (5 June 1976). "Jon Anderson's Fairy Tales". Melody Maker. Retrieved 4 September 2016. ^ a b Crescenti, Peter (26 October 1976). "The Sunhillow Saga". Circus. Retrieved 4 September 2016. ^ "Yes Singer Jon Anderson is Survivor". The Cleveland Sound. 30 August 2011. Retrieved 4 September 2016. ^ a b c Jones, Allan (27 September 1980). "Confessions of an Astral Traveller". Melody Maker. Retrieved 3 September 2016. ^ Griffin 1997, p. 44. ^ Welch, Chris (17 February 1979). "Shake a leg, jock". Melody Maker. Retrieved 4 September 2016. ^ Gardner, Ray (22 August 1979). "A force to be remembered". The Glasgow Herald. p. 6. Retrieved 4 September 2016. ^ Griffin 1997, p. 49. ^ Roberts, Chris (15 July 2016). "The real reason why Jon Anderson won't be making another album with Vangelis". TeamRock: Prog. Retrieved 15 July 2016. ^ "Roger Hodgson collaboration represents road not taken for Yes: 'One of those things that fizzled out'". Something Else! Reviews. 25 December 2014. ^ a b Bondy, Coleen (23 February 1996). "Yes Singer Jon Anderson's Love Affair with SLO by way of Atlantis". San Luis Obispo County Telegram-Tribune. Retrieved 3 September 2016. ^ "Higher Octave". Billboard. Vol. 107 no. 38. 23 September 1995. p. 40. ISSN 0006-2510. Retrieved 27 October 2016 – via Google Books. ^ McDonald, Steven. "Jon Anderson — Angels Embrace". AllMusic. Retrieved 3 September 2016. ^ Hill, Gary. "Jon Anderson — Toltec". AllMusic. Retrieved 3 September 2016. ^ "The Mothers Day Concert — Jon Anderson". Amazon. Retrieved 3 September 2016. ^ "Interview With Jon Anderson of Yes from 2001 (by Gary Hill)". musicstreetjournal.com. 2001. Retrieved 13 February 2016. ^ "Yes Singer Jon Anderson is Survivor". theclevelandsound.com. 30 August 2011. Retrieved 14 February 2016. ^ Kava, Brad (16 September 2004). "Singer reflects on 36 years of Yes". The Mercury News. Archived from the original on 11 October 2004. Retrieved 2 September 2018. ^ "VIDEO: Jon Anderson of YES Performs With CYO". CoolCleveland. Retrieved 17 March 2016. ^ "Jon Anderson - Tour Of The Universe". Discogs. Retrieved 17 March 2016. ^ "Jon Anderson - State Of Independence". Discogs. Retrieved 17 March 2016. ^ Witmer, Phil (13 November 2015). "21st Century Schizoid Man: How Kanye Changed Rap by Making a 70s Prog Album in 2010". Noisey. Retrieved 12 December 2017. ^ Nick DeRiso. "One Track Mind: Jon Anderson, "Open" (2011)". Somethingelsereviews.com. Retrieved 26 October 2011. ^ "Jon Anderson | Zamran Experience Preview". Sevendragons.org. Archived from the original on 10 February 2013. Retrieved 21 February 2013. ^ "Jon Anderson Still Working on Sequel to Olias of Sunhillow (by Sterling Whitaker)". ultimateclassicrock.com. 3 January 2013. Retrieved 7 February 2016. ^ "Jon Anderson still telling, writing his wondrous stories". The Aspen Times. ^ thodoris. "Interview:Jean-Luc Ponty (Anderson Ponty Band,Frank Zappa,Mahavishnu Orchestra)". Hit Channel. ^ "We would like to announce our first official date for the AndersonPonty band Spring tour. We will be at the Canyon Club in Agoura, California on April 30th". Facebook. 25 February 2016. Retrieved 14 March 2016. ^ a b "Here are ALL the dates for our AndersonPonty Band tour!". Facebook. 11 March 2016. Retrieved 14 March 2016. ^ "Video message from Jon Anderson - he's just finished a new album with Rione Stolt & friends called "Invention of Knowledge" and is about to tour Anderson Ponty Band with Jean-Luc Ponty". Facebook. 16 March 2016. Retrieved 16 March 2016. ^ "Jon Anderson - I think about writing everyday, so it's..." www.facebook.com. Retrieved 14 March 2016. ^ "Trevor Rabin - PS...great stuff happening with Jon and Rick". www.facebook.com. Retrieved 14 March 2016. ^ "Trevor Rabin - About the most I can say for now is that we..." www.facebook.com. Retrieved 14 March 2016. ^ "ARW – An Evening of Yes Music and More". www.arw-tour.com. May 2016. Retrieved 22 June 2016. ^ "Eagle Rock - YES Live At The Apollo". ^ Kielty, Martin (19 January 2018). "Jon Anderson finishing album he started 27 years ago". Ultimate Classic Rock. Retrieved 20 January 2018. ^ a b Masley, Ed (24 August 2018). "Jon Anderson reflects on 50 years of Yes, new solo music, Spinal Tap and more". Arizona Republic. Retrieved 28 August 2018. ^ "Jon Anderson Finishing Album He Started 27 Years Ago (by Martin Kielty)". ultimateclassicrock.com. January 2018. Retrieved 29 August 2018. ^ Mervis, Scott (6 March 2008). "Jon Anderson says Yes to the School of Rock". Pittsburgh Post-Gazette. Retrieved 22 May 2008. ^ Hedges 1982, p. 37. ^ IMDB pages: , , . ^ "Deborah Anderson | Listen and Stream Free Music, Albums, New Releases, Photos, Videos". Myspace.com. Retrieved 16 July 2014. ^ "Deborah Anderson Photography". Deborahandersonphoto.com. Retrieved 16 July 2014. ^ "Jade Anderson Bio | Jade Anderson Career | MTV". Vh1.com. Retrieved 16 July 2014. ^ Smyers, Darryl (28 February 2012). "Jon Anderson on Obama, Radiohead and Yes | Dallas Observer". Blogs.dallasobserver.com. Retrieved 16 July 2014. ^ Moynihan, Colin (22 October 2010). "Ari Up, a Founder of the Slits Punk Band, Dies at 48". The New York Times. Archived from the original on 21 September 2011. Retrieved 22 October 2010. ^ James, Gary. "Interview with Jon Anderson of Yes". Retrieved 24 January 2008. ^ Ryan, Tim (26 September 2003). "Positive on Rock". Honolulu Star-Bulletin. Retrieved 26 November 2012. ^ a b c "News - Jon Anderson Online". Jonanderson.com. Retrieved 16 July 2014. ^ "Yes - Jon's Back! (From The Bolton News)". Web.archive.org. Archived from the original on 13 June 2010. Retrieved 16 July 2014. Griffin, Mark J. T. (1997). Vangelis: The Unknown Man – An Unauthorised Biography. Lulu. ISBN 978-0-95231-872-9.